And the year moves on. Into late summer now and memories of being in Dublin on a short little break with the family and getting an hour or so free time to go shooting in Dublin’s city centre. I stayed around the Moore Street and Ilac Centre area taking shots of people on the move, and of course, looking for unusual ways to see them, which invariably means I am looking for reflections, be they in windows, the surfaces of cars, tiled walls, or just from the shadows thrown on the street. Got quite a few. Some I posted on my DSLR Flickr account and others on the iPhone one. 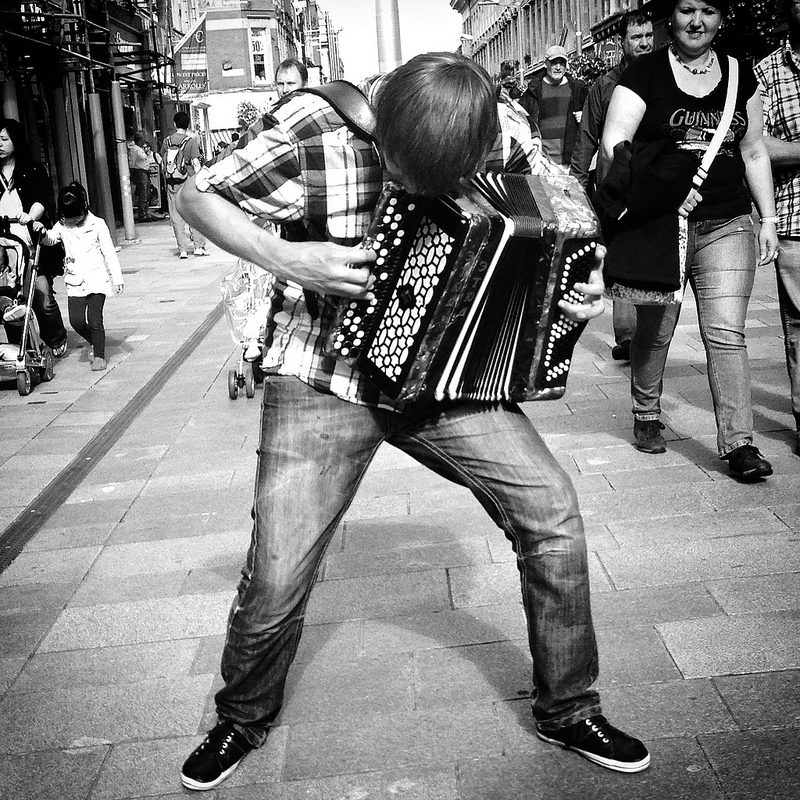 But the one I like most today is this one below of a street busker giving it all he has on the streets of Dublin. He was belting it out in a super-animated fashion. I gave the photograph the title “Photography for the Deaf” because, while it captures the moment, it cannot capture the sound of this energetic, young guy’s music. So, that is August. Thanks for all the visits and kind comments. This entry was posted in A Flickr Year, iPhone, My own favourite photographs, photograph posts.